Although this exaggerated scenario is still a long way off, Continental’s V.ply Technology is in fact a huge leap forward in the quest for the perfect tire. Our V.ply design was inspired by racing tire technology and executed through the extensive use of 3-D modeling and the Continental Group’s Research & Development know-how. It was also extensively field-tested in real-life conditions. V.ply Technology combines the best of cross-ply design and radial-ply design by integrating an innovative weaving pattern of multiple cords arranged at specially designed angles. Cross-ply technology is known for its superior damping properties and radial construction for its rolling resistance and high-speed capability. V.ply technology combines the best of both by integrating an innovative weaving pattern of multiple cords arranged at specially designed angles. The carcass of a V.ply tire consists of up to 20 layers of cross-ply fiber embedded in three wire beads. Because steel cord does not provide an optimal bond between the carcass construction and the rubber shell, the V.ply technology makes use of high-resistance polymer. This makes the production process more challenging but the benefits are worth this effort. 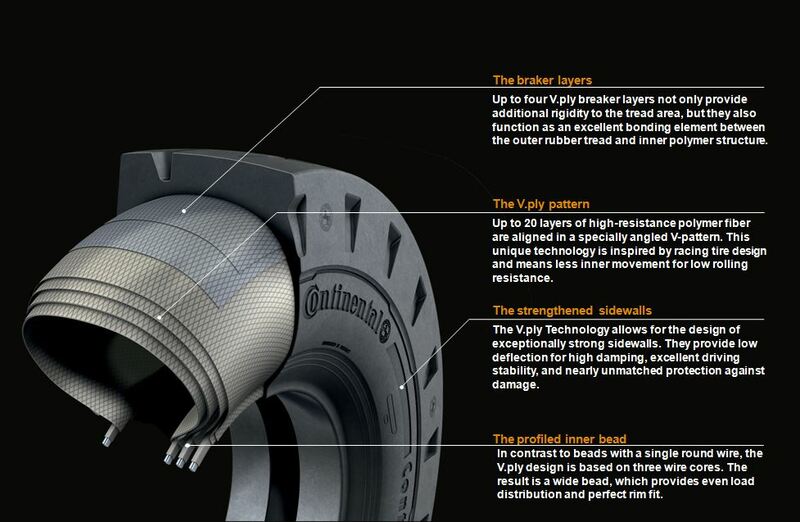 The outstanding damping properties and stability of V.ply tires are not only a result of the compressed air, but also of the exceptionally sturdy construction of the tire itself. V.ply technology allows the construction of thicker sidewalls compared to radial tires. Stronger sidewalls mean less tilting, improved protection against damage and a longer service life. The kissing effect of twin tires is also eliminated because the sidewalls are less inclined to flex and hardly have any contact. Moreover, the powerful construction of the new V.ply tires improves steering on the spot and tread cracks are significantly reduced.